Hybrid cars are becoming more and more popular and with new legislation it seems that they could well be the future. It is believed that by the year 2040 manufacturers will no longer be making the usual Petrol or Diesel cars, just Hybrids. 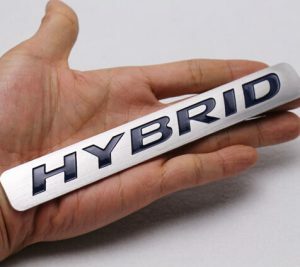 There are three main types of Hybrid cars but the main ones we are seeing through the garage are those that combine small petrol engines with an electric motor/motors. The car works by simply running on the electric motors at low speed and then engages the petrol engine when more power is required. When the petrol engine is running it is also charging the high voltage batteries which run the motors and completing the Hybrid circle. As Hybrid cars in general still have a petrol (or diesel) engine they still require servicing the same as any other car. Here at Aarons Autos we have the latest Diagnostic equipment to be able to fully check the electric motors, batteries, controllers and petrol engine of your Hybrid car. All of our staff are safety approved by the RMI (Retail Motor Industry) to work on Hybrid cars. Having your Hybrid car serviced at Aarons Autos will not affect your warranty, see our page about Block Exemption Law, and we use only genuine or OE (original equipment) parts.